Why is Google Censoring Search Results to Nix Warnings Just Like Ones Issued by a UK Regulator? 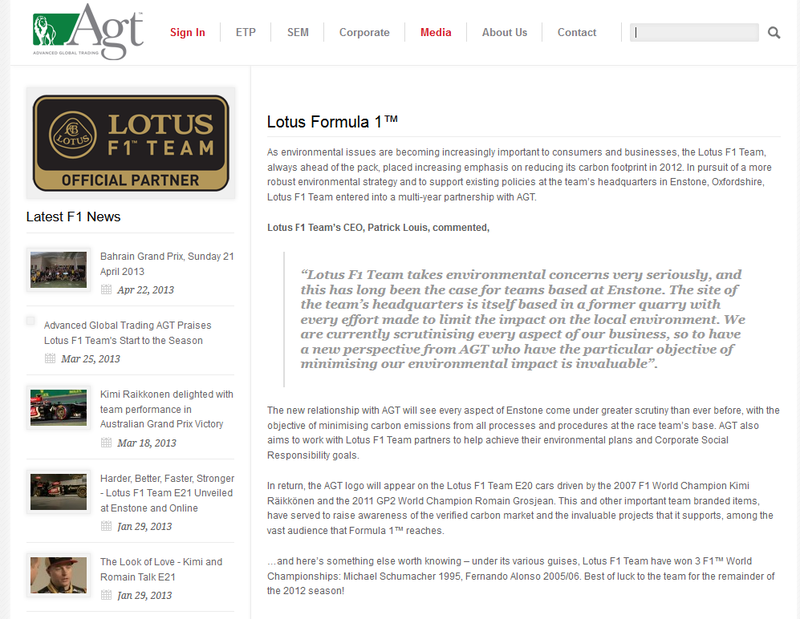 Through commitment from existing partner Trina Solar and through a new relationship with Emissions Spot Trading organization Advanced Global Trading (AGT), Lotus F1 Team is targeting significant carbon emission reduction and carbon neutral status in 2012. The new relationship with AGT will see every aspect of Enstone come under greater scrutiny than ever before, with the objective of minimising carbon emissions from all processes and procedures at the race team’s base. AGT will also work with Lotus F1 Team partners to help achieve their environmental plans and their Corporate Social Responsibility goals. AGT is one of the world’s most dynamic and fast-growing Emissions Spot Trading organisations within the voluntary Carbon Credit market. AGT’s passionate team of emissions professionals specialises in the sourcing and trading of Verified Emissions Reduction Carbon Credits (VERs) in the dynamic over-the-counter (OTC) green market. Nominated for Best Sustainable Investment at the 2011 International Green Awards, AGT’s specialist commitment to both historically-lucrative Carbon Credit trading for individuals and also encouraging companies to retire Carbon Credits as part of their CSR programmes, has helped it quickly become a global industry-leader, employing over 140 traders in the UAE, UK, Switzerland, USA, South Africa and Spain. The deal, whatever it was, led to AGT’s appearance on Lotus’s Official Team Partner page, for that is what Lotus call sponsors, these days. Has AGT been paying Lotus sponsorship fees, for a bit of reflected glamour? That’s one possibility. Whatever: look again at the “latest news” (left column) in that website screenshot, taken in the last few days: since April, AGT seem to have completely lost interest in the Lotus Formula 1 team, having reported their doings in some detail up until then. In fact, Lotus have been up to plenty since April: a string of podium positions has left them 4th in the constructors’ championship, between McLaren and Ferrari. But none of that seems to rate a mention from AGT. It looks as if the lights are on at AGT, but nobody’s at home. Advanced Global Trading sells voluntary carbon credits to members of the public as an investment. The company’s brokers cold call people and attempt to persuade them to invest. “For a minimum investment of $25K you too can invest in Carbon and make a difference,” the company states on its website. What price do AGT’s brokers charge for their voluntary carbon credits? In January 2013, Pete Barnes commented on REDD-monitor that “Advanced Global Trading are charging US$14.97 per credit.” In March 2013, Julius Cobbett, a South African journalist, reported that AGT offered him voluntary carbon credits at US$15.47 per ton. These prices are pretty high. Ecosystem Marketplace and Bloomberg New Energy Finance reported in their State of the Voluntary Carbon Markets 2012 that the average price for VERs in 2011 was US$6.2/tCO2e, up from US$6/tCO2e in 2010. The range of prices was “from less than $.1/tCO2e to over $100/tCO2e in 2011″. Cobbett points out that AGT doesn’t usually let clients choose the specific projects that their VERs come from (meaning that clients don’t know beforehand whether AGT is selling VERs from large projects in China or India that are worth very little). But unlike many companies that sell voluntary carbon credits as investments, AGT also offers a way of selling them, via its “Trading Platform”. Using this, AGT’s clients can see AGT’s current price and can buy and sell voluntary carbon credits 24 hours a day. Let’s ignore the fact that there are no units on the Y axis, the price. That doesn’t really matter, as long as the price keeps increasing. As long as AGT brokers can sell VERs at ever increasing prices to new clients, AGT stays in business. As long as all their clients don’t want to sell their VERs at the same time. Note, by the way, the alleged large purchase of carbon credits by Lotus F1. An increasing number of people are being approached by firms promoting investments in rare earth metals and related schemes. Rare earth metals are chemical elements used in the manufacture of products like computers, mobile phones, batteries, satellites and wind turbines. They may also be called ‘rare earth elements’. Despite being called ’rare‘, these metals are some of the most abundant resources – their name comes from the difficulty in extracting them from the earth. We are yet to see any convincing evidence that there is a viable market for retail investors to make money from investments in rare earth metals. Manufacturing companies that use the metals almost always buy them in very large quantities, making it highly unlikely they will deal with small independent retail consumers. It has been reported to us that callers promoting investments in rare earth metals are using dubious, high-pressure sales tactics and targeting vulnerable consumers. We believe the firms promoting investments in rare earth metals have previously been involved in selling other high risk and unregulated products such as carbon credits, fine wines, land without planning permission and overseas land and crops. There is a strong possibility of fraud with each of these products, including rare earth metals, because they are unregulated and it is difficult to confirm that the product or scheme exists, especially when it is said to be based abroad. It seems unscrupulous brokers attempt to take advantage of this uncertainty to get people to invest. It happens that AGT is based outside the UK, sells carbon credits, and pushes SEMs, too. In other words, this FCA warning fits AGT’s modus operandi to a ‘T’. It is unreasonable to call it a coincidence. Yesterday, Ian Hainey, AGT’s Public Relations Director wrote to REDD-Monitor. Unfortunately he provided no information to explain AGT’s ever more valuable carbon credits. He doesn’t object to the article, apart from the headline and the final paragraph. and on 27th May, positively sulkily. We therefore do not intend to give any credence to your blog’s postings, statements and/or opinions and see no utility for our clients or stakeholders in corresponding with you again. On the 31st May, AGT’s lawyers make a defamation complaint, covered at this NC post to Google, about redd-monitor’s May AGT blog posts and comments on those posts. Google.co.uk makes sure any search results that include redd-monitor’s May AGT posts don’t show any of the content; all the other Googles leave their search results uncensored. That demonstrates, perhaps, the low esteem in which English libel law is rightly held, around the world, and certainly, the futility of the complaint. On 4th June, the Dubai Ministry of Economic Development decides not to renew AGT’s trading license (just click “OK” to get past any Google Maps API message that might appear, the Dubai Med has a minor website bug). A group of clients have filed formal complaints about a local company that sells carbon credits as a green investment. Advanced Global Trading (AGT) claims that its investors can make 30 per cent returns by buying and selling carbon credits. But AGT clients say they have been unable to liquidate their investments for months, and market experts say the assets AGT sold have little to no resale value. At least five investors have filed complaints with Dubai Public Prosecution and the Dubai Department of Economic Development (Ded). “Now we are waiting for the prosecutor to say his word,” said “Ahmed”, an AGT client who spent US$100,000 (Dh367,320) on credits. “We have numerous clients who have reduced or sold their gold positions to increase their carbon position in large quantities, given the average opening balance across our clients is $36,000 with an average balance overall of around $150,000 and a significant number of our clients trade up to $5 million,” Stephenson added. According to Stephenson, the clients numbered around 1,000 by the end of May 2013, when the wheels had started to come off AGT. So that’s 1,000 clients times $150,000 balance. 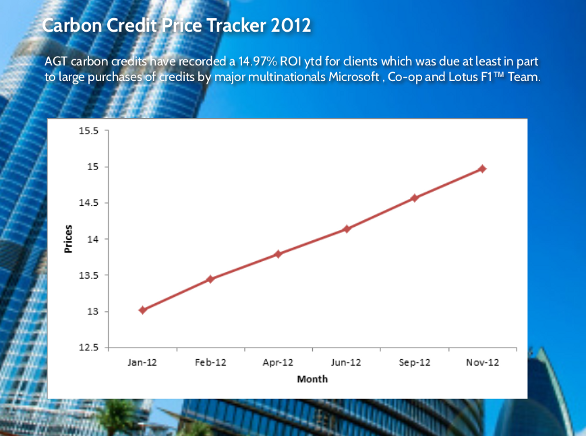 The average price for the type of credit AGT sells was about $4 in 2012, the most recent data available. AGT clients pay about $15 per credit. Mr Bayati would not answer questions about pricing, saying it was proprietary information. As a broker, the company provides an online trading platform and connects buyers and sellers, earning 1.5 per cent in commission. No client has ever lost money, according to Mr Stephenson. Righty-ho. So I think Stephenson is telling the truth about the balances and the number of clients. Maybe we can pencil in that $150Mn as the purchase cost of investor assets now apparently locked up in the non-trading AGT, but, one hopes, safely recorded on some register, somewhere. Mind you, a year’s worth of vigorous selling, extracting fresh commitments from existing clients, may have inflated the figure even more. An angry Kimi Raikkonen has confirmed he had to be talked out of refusing to drive at this week’s Abu Dhabi GP in protest at being “paid zero euro the whole year”. Raikkonen announced in September that he will leave the team at the end of the current campaign to return to Ferrari. Since then, his relationship with the Enstone outfit appears to have deteriorated rapidly, culminating in a sweary radio spat with trackside director Alan Permane at last week’s Indian GP and the Finn’s absence from the Abu Dhabi paddock on Thursday. It has now emerged that Raikkonen was prepared to skip this week’s event having grown exasperated with the team’s failure to pay his wages – and will miss the final races if “an understanding” on the belated payment of his wages is not respected. Now, it’s not unheard of for an established F1 driver to ply his trade for nothing; they can afford it, for a while. It’s done on the understanding that when the funding gap is filled, the driver gets some back pay. And that seems to be the deal here, except that it’s broken down. F1 teams aren’t in the business of deliberately making promises they can’t keep, either, so something’s gone wrong: Lotus isn’t getting all the cash it was expecting, or hoping for; that has been quite a problem recently. So, Lotus F1 are scrabbling around for more funding. Evidently there’s another sponsor that is in the process of disappointing Lotus F1: Advanced Global Trading. If AGT has folded its tents and departed into the night (all indicators point that way), there’ll be yet another sponsor to find; not a happy reflection, but part of life in Formula 1. More to the point, payments from AGT to Lotus, if there were any, would be a redirection of the imprudently invested life savings of several hundred naive and reckless small retail investors; whatever you make of their investing acumen, that’s not a happy reflection either. Alternatively, if the money flows in the other direction in that deal, AGT may have sold millions of dollars worth of overpriced carbon credits to the strapped-for-cash Lotus, and managed to get the AGT logo displayed on some very expensive, credibility-enhancing real estate: Lotus F1’s cars. Either way, it’s no wonder the Lotus press office haven’t yet replied to Redd-monitor’s pointed questions about their relationship with AGT, sent on the 12th August. All very embarrassing…and there’s something here for Sauber and McLaren, to think about, too. They both have deals with AGT’s ex-partner, Carbon Neutral Investments. This entry was posted in Auto industry, Carbon credits, Curiousities, Energy markets, Guest Post, Media watch, Ridiculously obvious scams, Risk and risk management on November 6, 2013 by Richard Smith. Chemtrails, weather modification, weather weapons, race cars ….. ponzi schemes… really? Each provides a good case of global warming…. how can you loose? Such a well developed scam based on the old front running scams. I will gladly pay you for a hamburger today so that I can eat it next week. Hey, I have some carbon credits to sell you on Mars. I have got a really shinny quarter that is fresh from the mint…. I will trade it for that old dirty disease ridden and used twenty dollar bill you have.. that twenty was probably used as toilet paper or a snot rag….. just give it to me and I will over pay for it with a fresh shinny quarter….just to be nice. VER trading OTC is a highly risky business and only experienced traders should participate. VERs are designed for offsetting not investing and so chances are people brought on board with these guys will lose most of the value of their investment. However, judging the price of a VER is also tricky. There are costs to transacting anything but the biggest factor is volume. Try purchasing, or offsetting, 1 credit and you will get a high price. Ask for 20,000 credits and you will get a much better price (at least from the legitimate companies! ), that is what brings the average price globally down to $6 per tonne. Most deals done are between large corporations and/or financial instiutions like Deutsche Bank where they will be dealing with 100s of thousands of credits at a time and so achieve much better prices. Coming back to the real issue… These VERs are not designed for individual investors to make money, they are for offsetting your carbon footprint so only purchase them for that purpose!